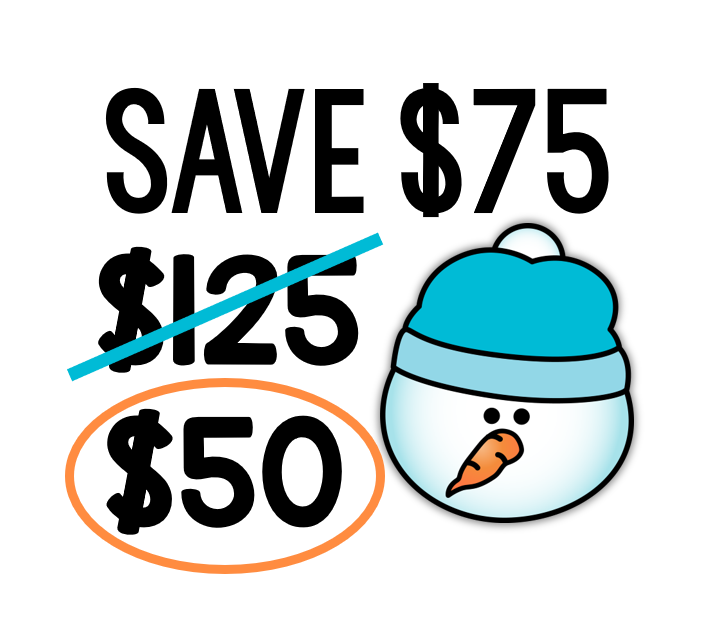 Winter Centers with a Freebie Preview and Giveaway! Hey all!!! I hope you enjoyed your break and ready or not… excited to kickoff the second half of your school year! 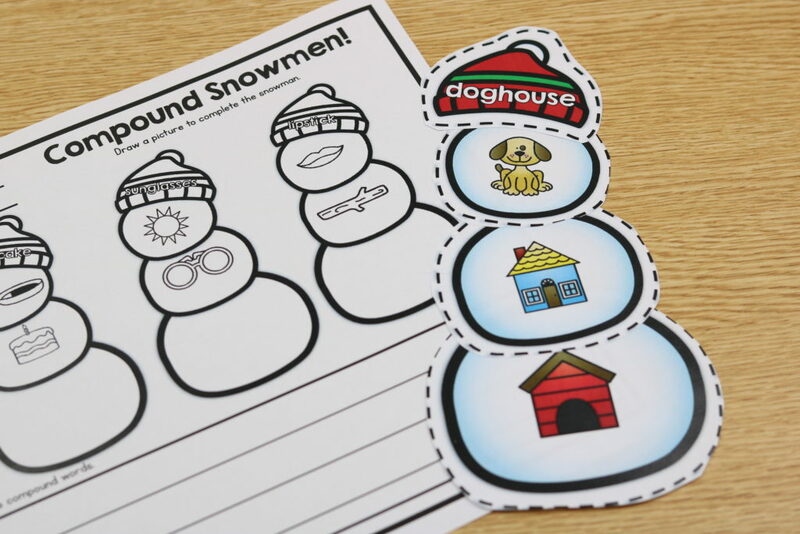 Today’s post is all about winter centers… but it’s filled with goodies aka freebies & GIVEAWAYS! Let’s get started! Now teachers unfortunately are always “prepping”. What are we prepping? Well, we preparing for our academic days! You see even if we work for awesome districts and they us these million dollar curriculum programs from these fancy smancy companies… they still don’t have everything our kiddos need! Something these programs lack is centers! 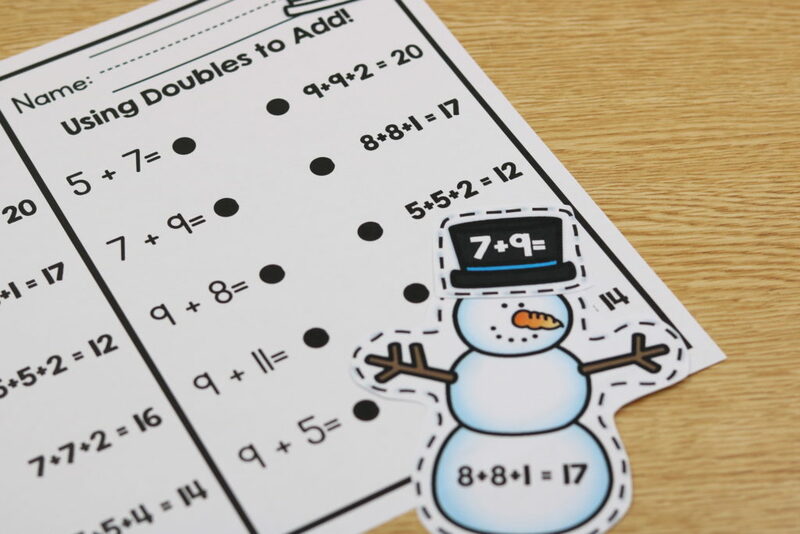 Centers are way for students to work independent. Why must kiddos work independently you ask? 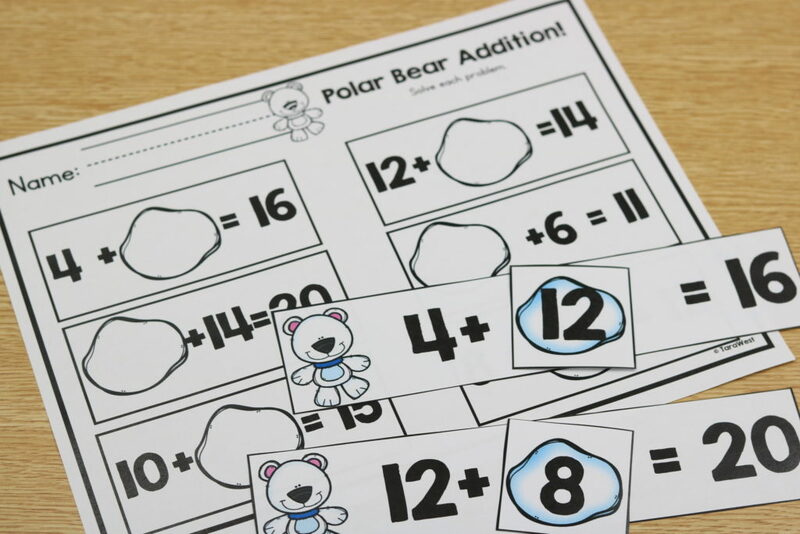 Students work independently for a variety of reasons but the majority of the time it is so the teacher can work with students in small groups at their own instructional level. Today I would like to talk more about centers! Last year I found myself scrambling for centers each week! Well… let me put it this way…. quick! What can I print, laminate, cut and throw into a basket without staying here until midnight!? HA! A little dramatic… but pretty much! Another biggie was my kiddos’ OBSESSION with our weekly KinderLiteracy themes! They ate it up and wanted more, more, more! We couldn’t read enough books or watch enough YouTube clips for our theme! The first time I showed them our new themed centers….well they flipped out! What does that mean in teacher lingo? Happy kids equals ENGAGED kids! 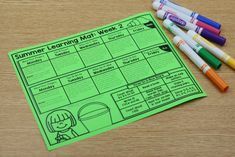 I’m sure you’ve ran across many center packets on TpT and I have several in my shop as well. 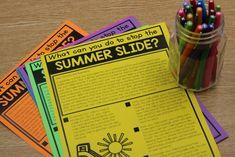 They are all fantastic… but I still wanted more for my kiddos! 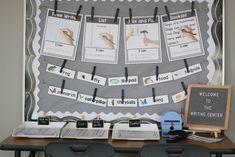 They loved their skill focus centers for alphabet, sounds, rhyming, etc…. 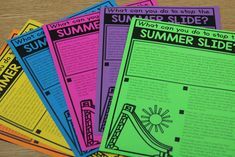 However, I wanted centers that would match up to our class themes and centers that would be so fun… they’d forget they were learning! 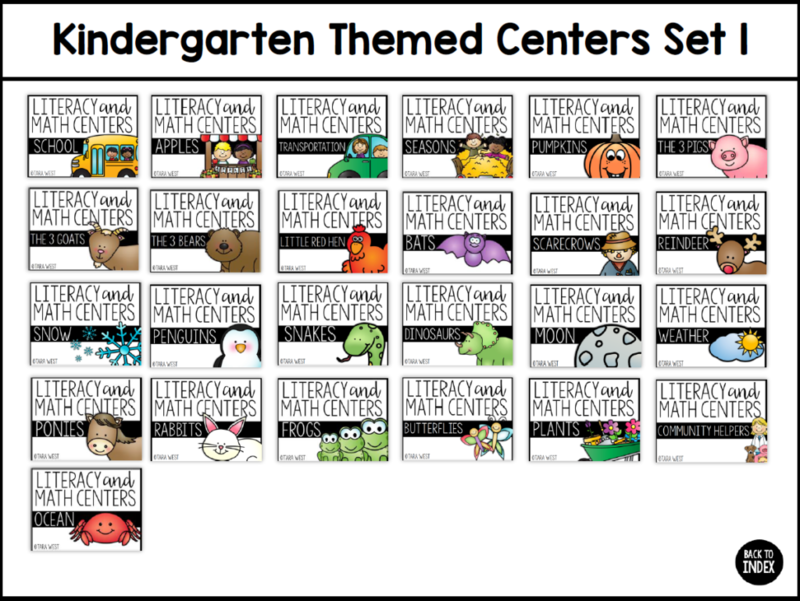 After many requests for additional Kinder themes, I then created a second set of Kinder centers! 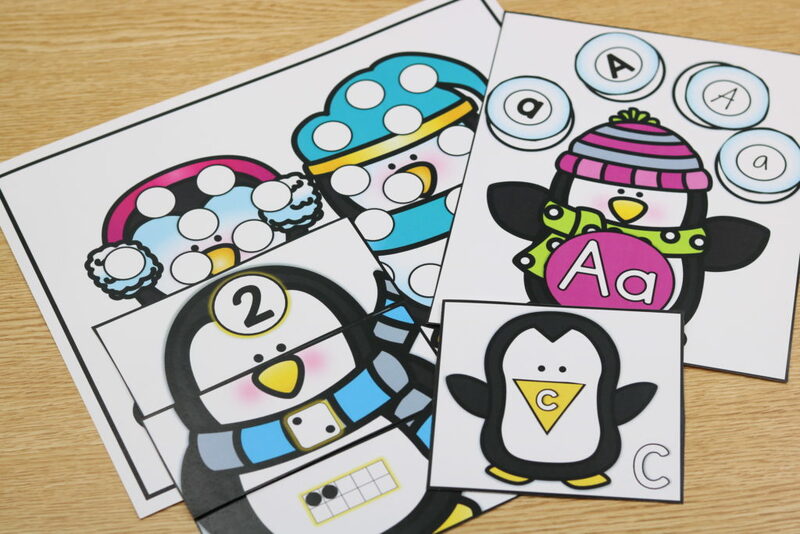 This set is all NEW themes for Kinder! 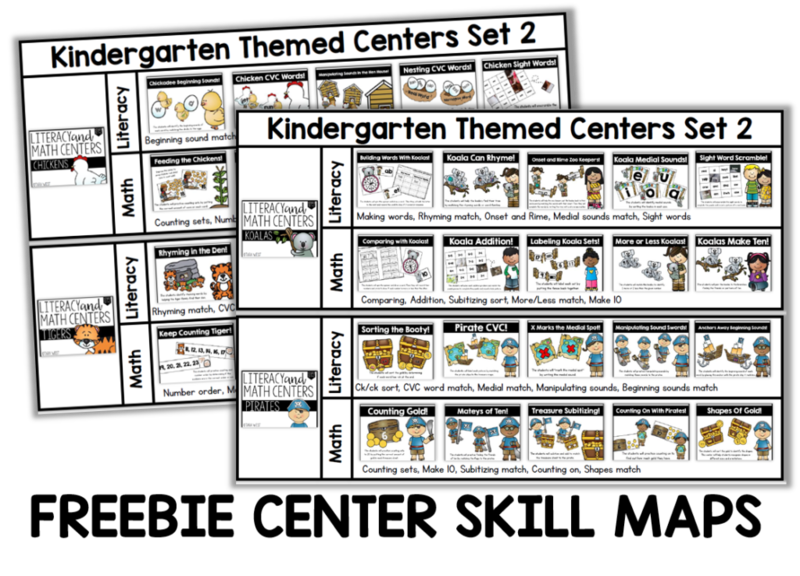 This is Kinder Themed Centers Set Two! 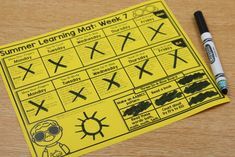 *Below is a look at the the Kinder Themed centers in ACTION! These two centers will be part of the FREEBIE! This of course isn’t all of the centers but gives you a great look! 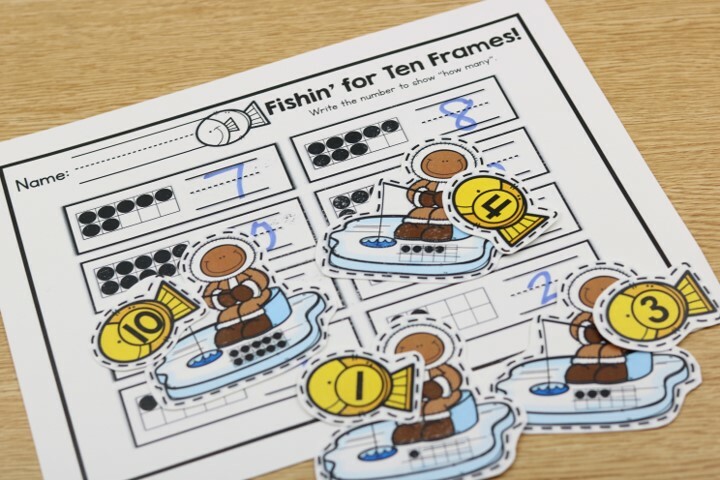 Up next I’ll share about the 1st grade themed centers set 1! I get a lot of questions about if they two bundles are the same! The answer to that is yes and no! No being that there are no duplicating centers… all the centers are unique in their skill! Yes, because you’ll notice that some of the clip art is the same! After many requests for 1st grade centers (from kindergarten teachers), I created a set that would be close for visual purposes! Kindergarten really wanted to use the centers for their higher kiddos without drawing a lot of attention…as the centers would visually look similar! 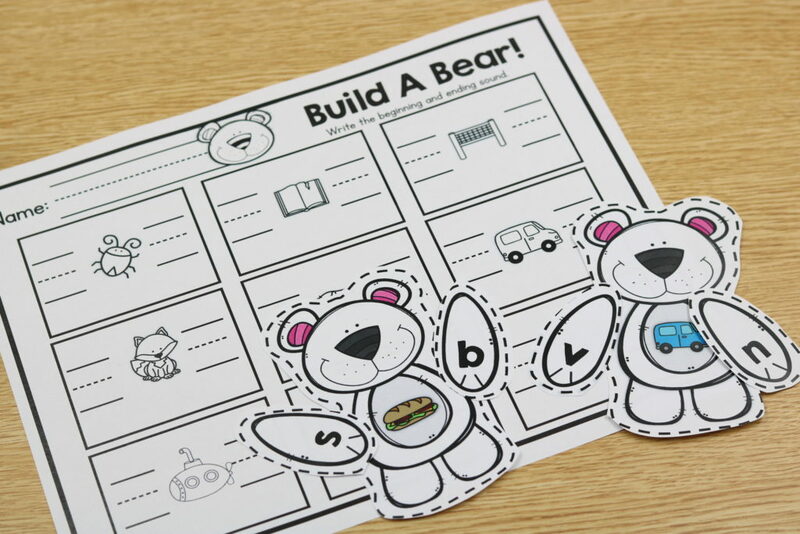 Then of course to follow suit with Kindergarten, I made a second set of first grade centers! 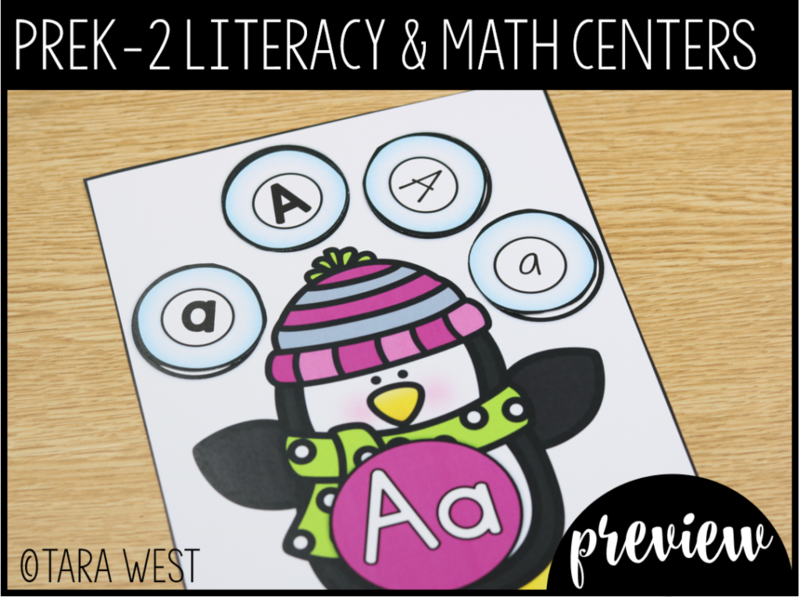 Let’s take a look at the First Grade Centers Set Two! *Below is a look at the the Firstie Themed centers in ACTION! These two centers will be part of the FREEBIE! Up next was of course second grade themed centers! *Below is a look at the the Second Themed centers in ACTION! These two centers will be part of the FREEBIE! I really thought I had MASTERED and CONQUERED every last wish for centers in all of center land HAHA! However, I had left out Pre-K and that’s no good! The centers had been on my list forever and to finally be able to bring them to you made me so happy! I got emailed a lot from Pre-K teachers that were desperate for appropriate Pre-K materials! 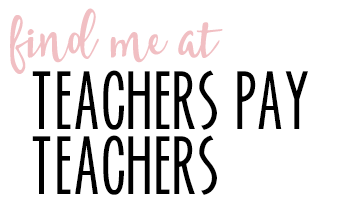 I think Pre-K teachers are complete SAINTS to start with to work with out littlest learners but then to constantly take kinder curriculum and knock it down a few notches– well they are SUPER SAINTS! 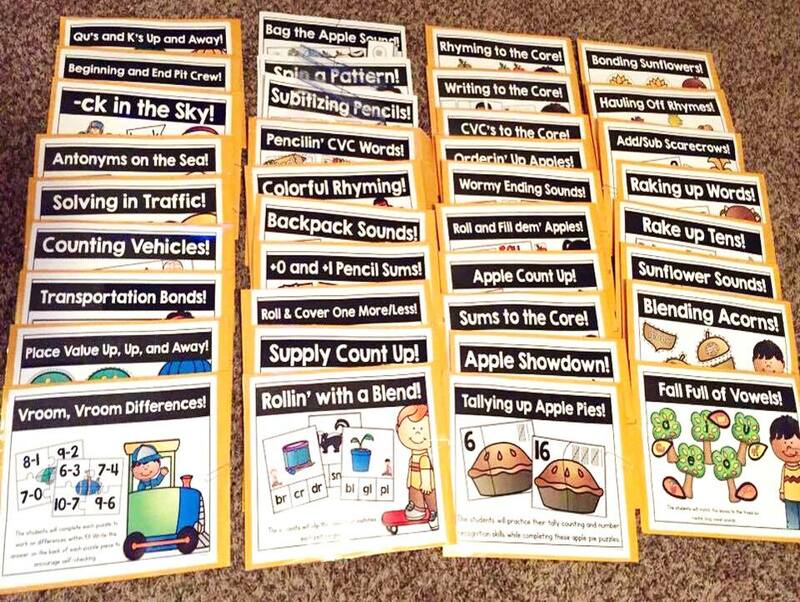 The Pre-K themed literacy and math centers bundle includes 25 themes and a total of 250 centers WOOT!!!! 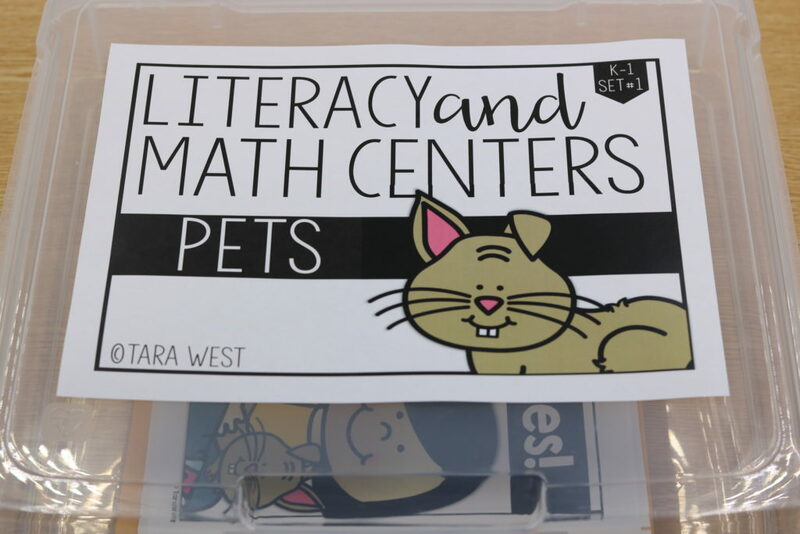 Each of the themed center packets include 5 literacy centers and 5 math centers! 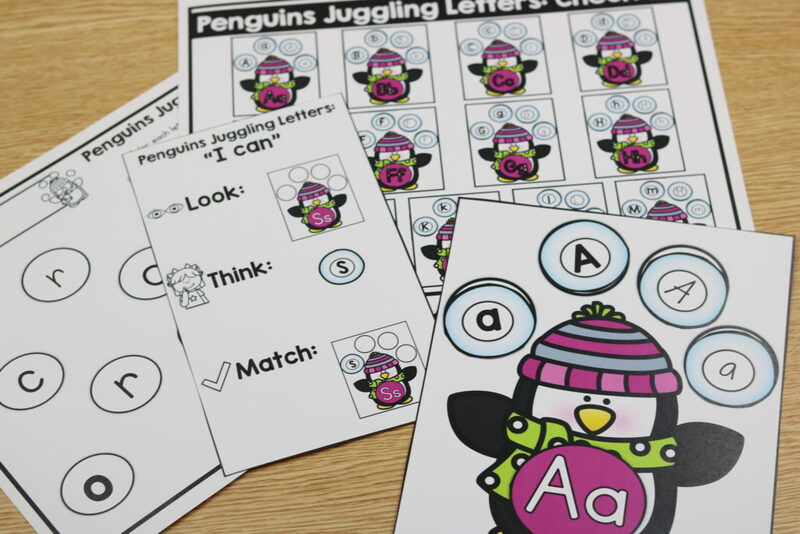 Each of the centers come with an “I Can” card, recording sheet and a self-check sheet! 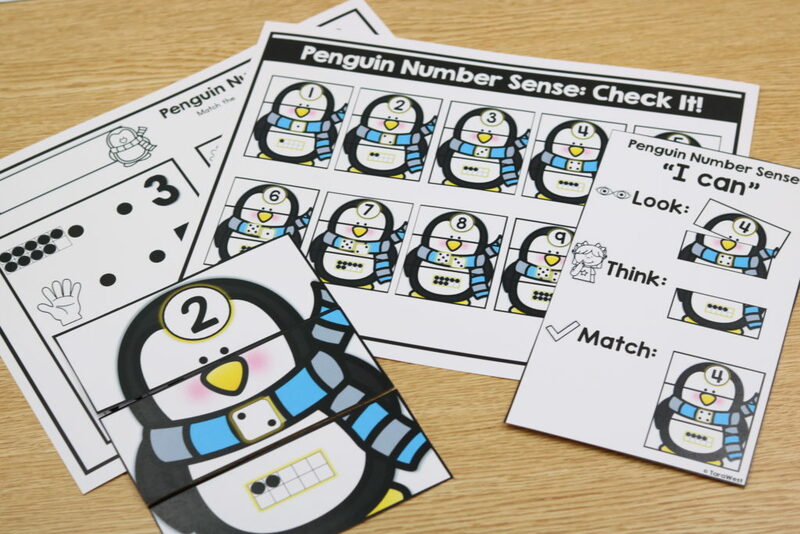 Along with these included sheets, each bundle also comes with teacher observation check lists! 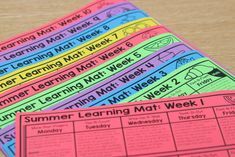 This is perfect for teachers and aides that need documentation for student work! 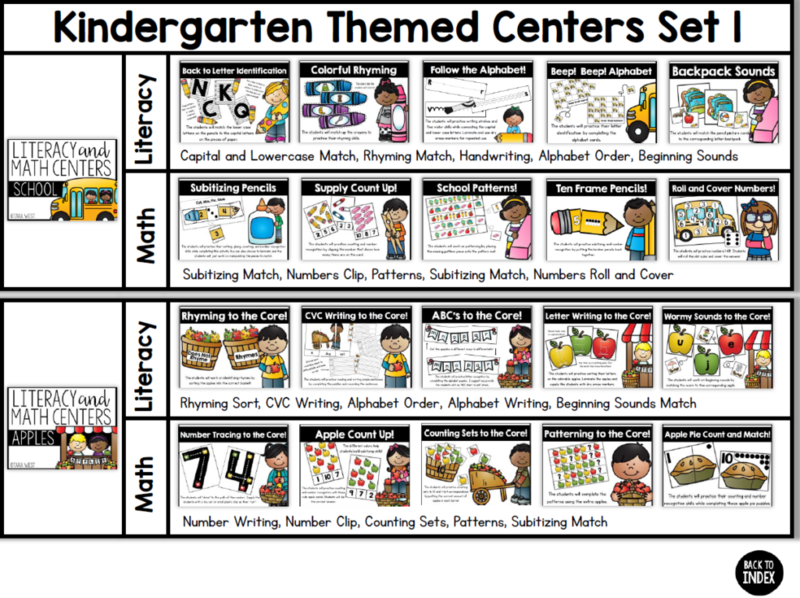 *Below is a look at the the Pre-K Themed centers in ACTION! These two centers will be part of the FREEBIE! When it comes to my themed literacy center packets, I am often times asked these three questions! 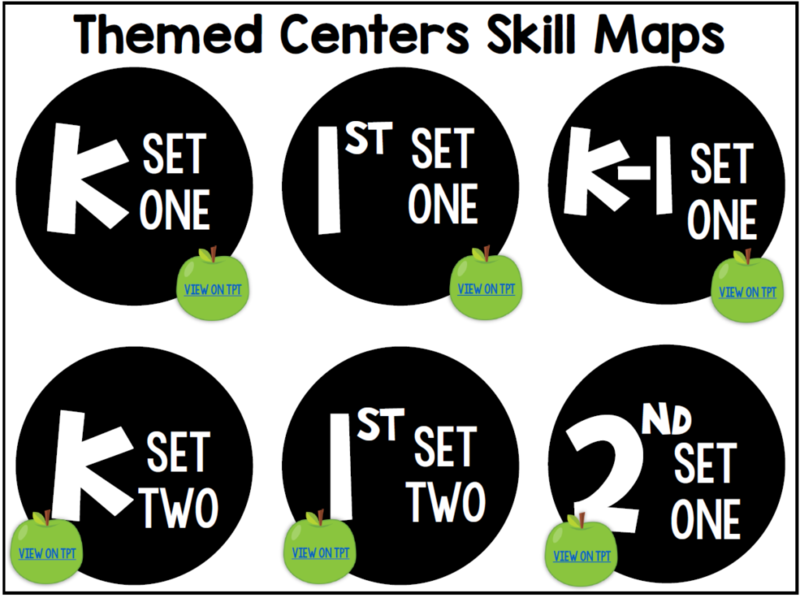 QUESTION #1: HOW DO YOU STORE ALL THE CENTERS? This is a common question I get and it truly depends on you and your style! I am still a huge binder hoarder when it comes to storing centers. I like placing each center into a sheet protector, tabbing the first center under each theme, and then quickly flipping to it! However, YOU guys quickly changed my thinking this past summer! I just love how the centers below have been easily stored in cheap , yellow, mailing envelopes! I am also totally guilty of the IRIS container love! They are super sturdy and great for storing multiple centers as well! Another AWESOME idea is to store the centers in containers! 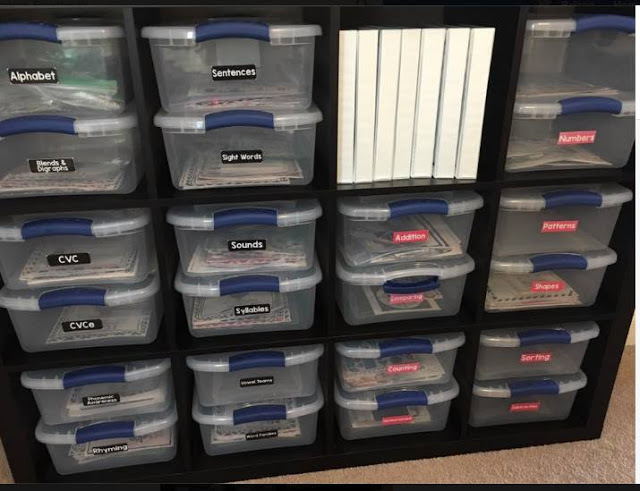 Below, Courtney has stored her centers in Rubbermaid containers! You can snag these labels for free HERE. If you would like to edit them yourself then you can download an editable format HERE. QUESTION #2: HOW IN THE WORLD DO I PRINT ALL OF THESE COLORED CENTERS? Well, this question is kind of two-fold! I have included ALL centers in a color and black/white version! However, most of us still prefer to print in color… so how in the world do we do that on a budget? 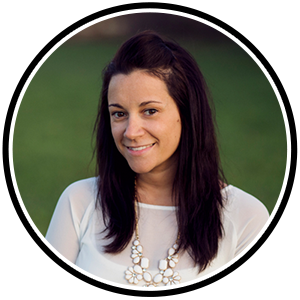 You most likely have heard about instant ink… and if not well then, Lauren explains all about it here! That also leads us to our first GIVEAWAY! WOOOOOOOOT!!!!!!!!!!!!!!!!!!!!! So yes the whole “instant ink crazy”. That is what I used to think when I heard people talk about it! But I’ll admit that I took forever to get a smartphone, too lol! 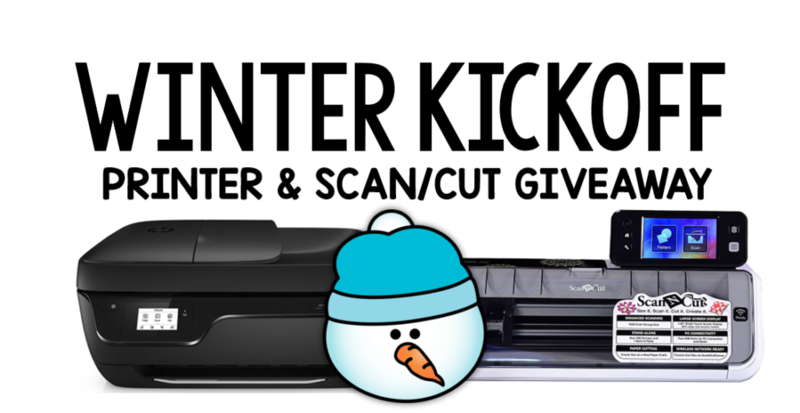 With Instant Ink you do want to make sure that you have purchased a compatible printer or it won’t work (booo!!!) So this printer is on the approved list (YAY!) The giveaway is for the printer and the initial Instant Ink card they offer on Amazon with it! I will also ask the winner if they want Black or White/Purple as it’s currently offered in both colors! 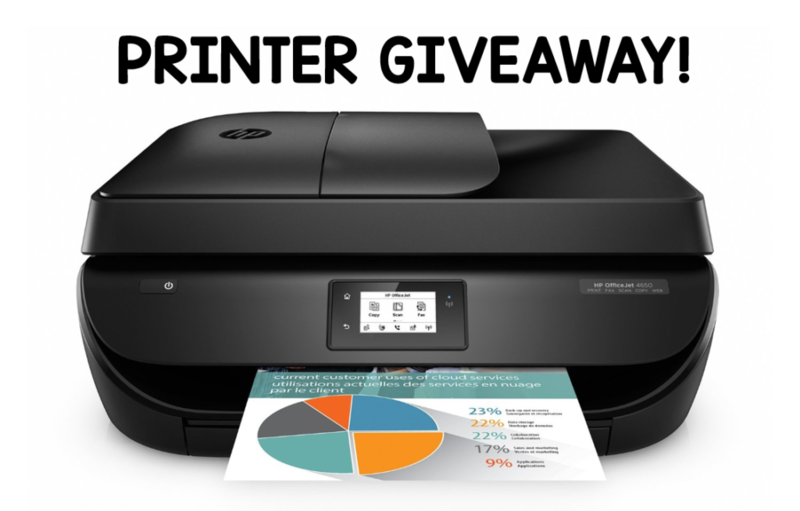 You can read up on this exact giveaway printer HERE. Keep reading below for the Rafflecopter in order to enter for the giveaway! QUESTION #3: HOW CAN I POSSIBLY CUT ALL OF THESE? Breaking down how to use the Scan and Cut for those “tricky” cutting jobs! 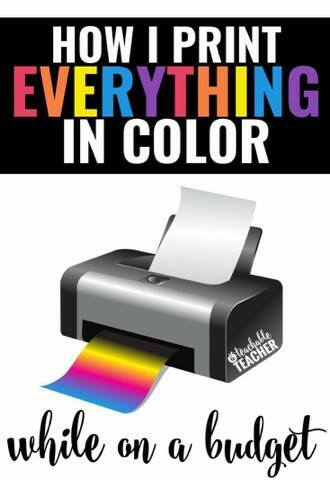 I am giving away one printer to a lucky teacher and one Brother Scan and Cut to another lucky teacher! It’s easy peasy to sign up below! I’ll choose winners on Sunday 1/14 ! Choose any of the ways to enter below or all for more chances! If the Facebook group link doesn’t work, you can try THIS LINK instead. Enter below or HERE on the Rafflecopter. If you do not see the Rafflecopter pop-up, please try to enter on a different device, my apologies in advance for any inconveniences! Well… that’s all I have for you! I hope you have a great week!